Darian and Ritu have been organizing this conference for two years now. 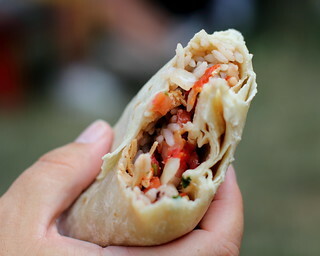 Darian offers up this social media insight called the Burrito Principle. How many times have you seen people in the grocery store or waiting to pick up their sandwich order or their burrito from a burrito truck – while standing in a line and browsing their mobile phones? It’s called “found time,” as Udi Ofer, CEO, ACLUNJ once described when I asked how to you find the time to tweet? This is the time you should should be posting and engaging on social channels. check out or better yet, join our keynote Beth Kanter and us in San Francisco on October 10-11, and use the discount code “Beth” to save $25. As the end of the year draws near and nonprofits large and small start thinking about strategies to break through the clutter and raise big bucks, Beth asked me to share a simple yet important tip for ensuring your message is heard when you put together your email appeals and online fundraising campaigns. Aside from our beloved Beth Kanter, John Haydon and many other top social media professionals have written about the best times of day to post your messages on the world’s largest social networks. Often these tips contradict one another, so as we gear up for the biggest fundraising time of the year, I decided to combine some data with the personal experience gained producing the Nonprofit Boot Camp and Social Media for Nonprofits conferences (next up, SF on 10/10-11, with a keynote by Beth!) and a bit of common sense… introducing The Burrito Principle. I hope this small tip helps you reel in the big bucks as 12/31 roles around, and if you’re interested in learning more about our efforts producing the nation’s only conference series devoted to social media for social good, check out www.SM4NP.org or better yet, join our keynote Beth Kanter and us in San Francisco on October 10-11, and use the discount code “Beth” to save $25. I’ve done a lot of research on this topic and have read that Wednesday is THE best day of the week to post on Facebook, with Wednesday at 3pm being a time that works well to engage on all 3 major platforms (Twitter, Facebook and LinkedIn). What is the reasoning behind Wednesday being a bad day? I’ll let Darian respond to your question about what specific research he was basing that on. BTW, do you have links to the studies you looked at? Thanks again for your insight comment. This is one of the articles that I’m referring to, it references data that bit.ly released. In this Mashable article you’ll see that Facebook’s best time is 3pm on Wednesday. Of course, the timing will never be the exact same for everyone, but I thought this article had a good summary of optimal times for the different platforms. That article is over a year old, do you think there has been changes? Also, did you look at Dan Zarella’s research. Also, for Facebook, the new report in Insights that tells you what time your fans are online is also a useful data point. Debbie- Thanks much for your comment! Yes, there’s definitely a *lot* of conflicting information out there. Blackbaud was the one that shared day of week info, but I’ve seen the Weds 3pm data (i.e. http://www.entrepreneur.com/article/226973?goback=.gde_66325_member_254889664). Like I said in the blog, just trying to use common sense and anecdotal experience, but happy to look at anything else you’ve seen.